Fibroblast-mediated collagen gel contraction does not require fibronectin-╬▒5╬▓1 integrin interaction. healing, fibrosis, scar contraction, and connective tissue morphogenesis. 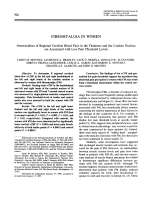 fibronectin-a,P, interactions are not necessary for collagen gel contraction. interactions but dependent on an interaction of p1 integrin matrix receptors with collagen fibers. o 1992 Wiley-Liss, Inc.
(Bell et al., 1979). Collagen gel contraction is believed gel contraction. Received October 30, 1991; accepted February 28, 1992. Sciences, Biomedical Sciences Bldg., Rm. 553, The Uninell, 1985; Tomasek and Hay, 1984). The mechanical versity of Oklahoma Health Sciences Center, P.O. Box 26901, Oklareorganization of the collagen fibrils has been proposed homa City, OK 73190. 1988; Wayner et al., 1988; Gullberg et al., 1989; Clyman et al., 1990). role of p, integrins in collagen gel contraction was investigated using a n antiserum and a monoclonal antibody, which can inhibit the function of p1 integrins. 1987). Monoclonal anti-a, antibody (PlD6) was obtained from Telios Pharmaceuticals and has been previously characterized (Wayner et al., 1988). 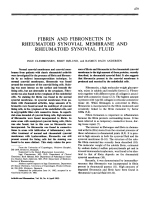 FBS was used in place of the fibronectin-depleted FBS. Type I collagen (rat tail tendon, acetic acid extracted) final collagen concentration was 0.75 mg/ml. Island, NY). Fetal bovine serum (FBS) was purchased optics. experiments were between cell passages 4 and 10.
wells were then averaged together. 10 hr under the conditions used in this study (Fig. 2). not necessary for collagen lattice contraction (Fig. 2). addition, none of the agents tested affected the spreading of cells in collagen gels (data not shown). prepared with fibronectin (Fig. 7). 7, all these agents significantly inhibited cell spreading on fibronectin ( p < 0.01) at the Same concentrations as those used in the collagen gels. 10%fibronectin-depletedFBS as described in Materials and Methods. the lattice. Bar = 3.5 mm. indicated by the vertical bars. ranges are indicated by the vertical bars. which is the same antibody subclass as mAb 13 (Fig. (V-01,and 100 pg/ml (A-A) of anti-a, integrin antibody (mAb 16). are shown and the total ranges are indicated by the vertical bars. contraction in the presence of 1 mg/ml of a control rat IgG,, monoclonal antibody (-). and the total ranges are indicated by the vertical bars. determinations from random fields of cells ( 2SEM). the control cells assumed an elongate bipolar configuration in the collagen gel (Fig. 9b). antibody, after 24 hr in culture, resulted in cell elongation and collagen gel contraction (data not shown). of a control rat IgG,, monoclonal antibody (b). Cells were photographed with Hoffman modulation contrast optics. Bar = 75 pm. subfamily of integrin matrix receptors. variety of inhibitors of cell-fibronectin interactions. in agreement with a previous report by Gullberg et al. integrin receptor (McDonald et al., 1987) does not inhibit collagen gel contraction. blocks its binding to fibronectin (Akiyama et al., 1989). cell-binding region of fibronectin (Elices et al., 1991). with fibronectin is not necessary for this process. underway to test this possibility. et al., 1988; Gullberg et al., 1989; Clyman et al., 1990). same cell may participate in attachment to collagen. 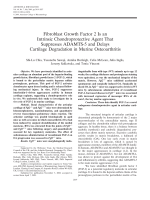 Dr. Robert Buchanan of the Department of Plastic Surgery and Dr. Gaza Rayan of the Department of Orthopedic Surgery, University of Oklahoma-Health Sciences Center, for their contributions of tissue, and Dr.
antiserum used in this study. This research was supported by grants from the Presbyterian Health Foundation (PHF 101 and PHF 85) to Dr. James Tomasek. have appeared examining the role of the integrin receptor azpl in collagen lattice contraction: Schiro et al. (1991) and Klein et al. (1991). 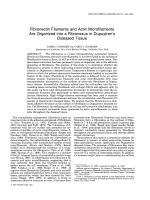 The interaction of fibronectin fragments with fibroblastic cells. J.
biological assays for the purified cell-binding domain of fibronectin. J . Biol. Chem., 260:10402-10406.
cytoskeletal organization. J . Cell Biol., 109:863-875. Akiyama, S.K., S.S. Yamada, and K.M. Yamada 1986 Characterization of a 140-kD avian cell surface antigen as a fibronectinbinding molecule. J. Cell Biol., 102:442-448.
by fibroblasts requires cellular fibronectin but not plasma fibronectin. Exp. Cell Res., 193t167-174. of different proliferative potential in uitro. Proc. Natl. Acad. Sci. matrix and the cytoskeleton. Annu. Rev. Cell Biol., 4:487-525.
lattice contraction utilizing a normal and transformed cell line, J .
are differentially influenced by Arg-Gly-Asp peptide and by divalent cations. J. Cell Biol., 112:169-181.
cell behavior. J . Cell Biol., 41:298-311. Guidry, C., and F. Grinnell 1985 Studies on the mechanism of hydrated collagen gel reorganization by human skin fibroblasts. 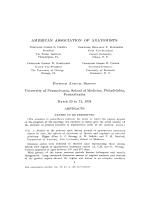 J.
Guillery, P., F . 4 . 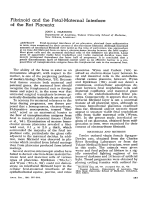 Maquart, and J.-P. Bore1 1986 Fibronectin dependence of the contraction of collagen lattices by human skin fibroblasts. Exp. Cell Res., 167r29-37. contraction is stimulated by PDGF. Exp. Cell Res., 186t264-272. of integrin-like matrix receptors with affinity for interstitial collagens. J . Biol. Chem., 264:12686-12694.
carboxyl-terminal half of human plasma fibronectin. J . Biol. family. J . Biol. Chem., 262:3300-3309.
fibroblasts and highly aggressive melanoma cells in three-dimensional collagen lattices and mediates the reorganization of collagen I fibrils. J . Cell Biol., 115:1427-1436. McDonald, J.A., B.J. Quade, T.J. Broekelman, R. LaChance, K. Forsman, E. Hasegawa, and S. Akiyama 1987 Fibronectins cell-adhesive domain and a n amino terminal matrix assembly domain participate in its assembly into fibroblast pericellular matrix. J. Biol. process into three phases. Collagen Rel. Res., 8:259-273.
expected of a fibronectin receptor. Cell, 40:191-198.
from fibronectin. Proc. Natl. Acad. Sci. U.S.A., 825766-5770.
adhesion of platelets to collagen. Cell, 46~913-920. (VLA-2) mediates reorganization and contraction of collagen matrices by human cells. Cell, 67:403-410.
fibroblast traction. Dev. Biol., 90:383-398.
fibronectin correspond to VLA-2 and VLA-3 and in the VLA family of heterodimers. J . Cell Biochem., 37:385-393.
fibroblasts: Distribution of actin, alpha-actinin, and myosin. Dev. glycoproteins Ic-IIa. J. Cell Biol., 107:1881-1891.